Can you spare some time to help alongside our incredible volunteers to get Langsford Park ready for next season? If you go behind the scenes at most non league football clubs, you’ll no doubt find a small army of truly dedicated volunteers who put in endless hours of their time, for absolutely nothing. Meet Richard, Derek and Eric. 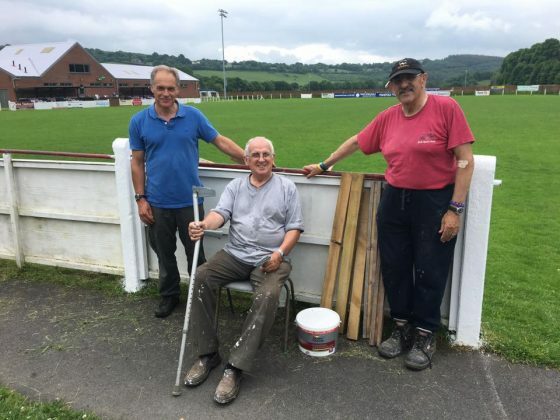 Come rain, wind or shine, these incredibly selfless volunteers, along with a small handful of others, are down at Langsford Park, nearly every single morning, to ensure the pitch is maintained to its very high standard and the surrounding areas and facilities are in good working order, clean, safe and tidy. The men are incredibly proud of the efforts and hard work they put in each week and rightly so. With its highly-regarded pitch and the backdrop of the rolling Devon countryside surrounding it, Langsford Park stands out as one of the most picturesque non league grounds. “I am very proud to say that I am a member of the morning crew,” tells Derek, who has been involved with the Club for more than 50 years. “All pensioners, who volunteer their services, to carry out day to day repairs and maintenance work. “I also help Richard maintain the ground and mow the grass when it needs doing, to provide the best playing surface possible, so our talented teams can play their their pass and move eye-catching football. However, it’s not easy work for the men who, amazingly have a combined age of more than 200 years; whether it’s mowing the lawn, painting the posts and metal work, fixing the dugouts or replacing boards and fencing, these volunteers have their work cut out to get things ready ahead of preseason. “We have six Saturdays before the first fixture against Argyle”, explains Eric, who has been involved with the Club for more than 20 years. “I propose we make every Saturday, the morning at least, to make it a work day. “Our priority; 130 posts, rails and back of groundboards to be painted. We can get it really spick and span if we get the help that is required. All we ask is you bring brushes and suitable clothing. If you think you can give some time to join our fabulous volunteers, then please get in touch. They will be there every Saturday morning (from today) for the next six weeks and would really appreciate any help they can get. We also have other opportunities for volunteering at Tavistock AFC – if you’re interested, please get in touch with us.